Here's an interesting photo...if you're into tabby. This pattern doesn't really need a tabby since there are never floats longer than three threads but that doesn't mean I can't add one if I want. There aren't any tabby police out there ready to arrest me for misappropriation of tabby. At least I don't think so. 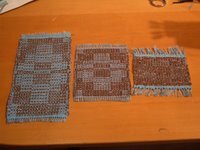 The first sample on the right has no tabby - I just wove exactly what was indicated in the pattern. I was thinking that that piece was a bit dark and could use a bit more of the blue coming out. Thus, I decided to try adding a tabby in light blue which would alternate with the pattern weft in cassette tape. Next I wove the one on the far left. I used a tabby yarn which was the same as the warp - a 5/2 cotton. 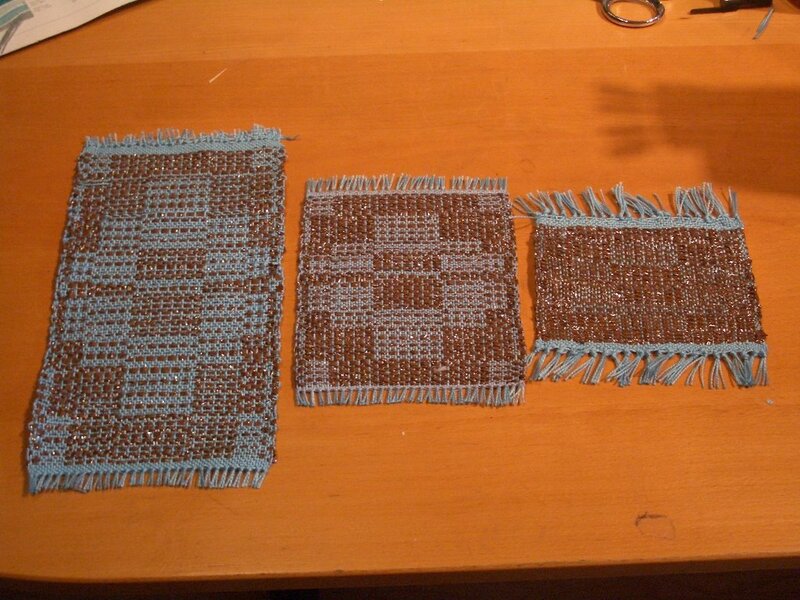 The middle sample used a 20/2 perle cotton as the tabby weft. I like the middle one the best from the perspective of value contrast and size. The flower seems distinct enough without becoming too diffuse. To paraphrase the tale of the three bears...one was too big...one was too small...and one was just right. Yes, just right! Are you going to vary the color of the tabby even more? Are you using the tape single or double? This is what I love about weaving...so many possibilities!